Linux games suitable for an arcade cabinet? Re: Linux games suitable for an arcade cabinet? You mean, specifically for Linux... tux racer... other than that, I think emu's and what runs under wine is about it... at least for my interest.. This is a fun little Tron lightcycle game. Great fun with 2 players or more. 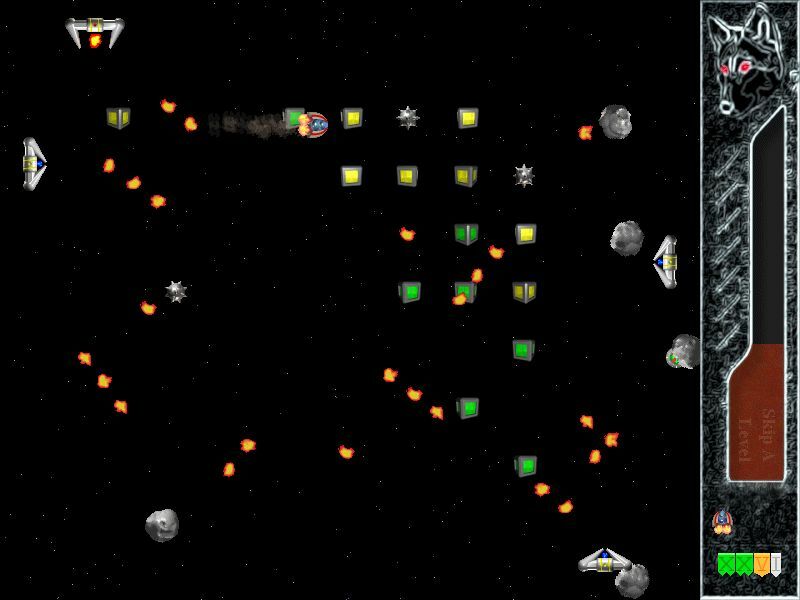 Grid Wars an open source clone of Geometry Wars. Now that it's got a CPU opponent option, it doesn't even need the network option (although that is nice if you can find enough opponents). Pretty much all of Kenta Cho's games have been ported to Linux. They are very suitable for a Linux cab, and Wah!Cade or whatever you use should easily be able to launch them cleanly. world of goo will be fantastic to use with a trackball if they ever release their linux version! Start looking at www.happypenguin.org, tons of stuff there. I also have a few Linux games I'll share once I get my server back up and running. Works in wine, at least the demo does. Frozen Bubble is like Puzzle Bobble.. There is a build to Linux as well Windows. I have not compiled the source to Linux by myself (due the sourcecode is included). Nebulous (Better known as "Tower Toppler"
Another bump, this time for X-Rick, a re-engineering of the old Amiga game, Rick Dangerous. You can re-map the default keys for the thing when you start it from the command-line, and you can specify "fullscreen" mode as well. It's basically a joystick + 1 button game, but a little weird to get used to initially as up/down has multiple meanings if you hold down the button or not. Very much a fun retro-platformer. As the sources were recently released for it, check out "Rom Check Fail". Mish-mash of various retro games (SMB, Defender,Asteroids, etc.) that switches the player and enemy types at random every few seconds. Definitely one of those games made for a 15KHz resolution. [Edit] Just tested the game out on my NEC XM2960 after adding the 256x240 modeline. This is a game MADE for an arcade monitor. Other games that seem to be made for an arcade cabinet/monitor would include Cave Story+ (not sure of a way to legally get it, since the latest Humble Indie Bundle closed), VVVVVV, and OpenTyrian. Others I could think of include Rocks and Diamonds, Dodgin' Diamond 2, Freedroid, Stepmania (if you enjoy DDR and/or Pump it Up), and just more than I could even think of over at the Linux Game Tome and Linux Game DataBase sites. It's a vector-styled side-scroller shooter, something of a hybrid between Defender, Scramble, with a whole bunch of "Bullet Hell" shooter effects. The soundFX on this are a blast! Super Hexagon and Open Hexagon have Linux ports. Everyone should play every day, or at least once! Only ran it in 640x480 interlaced, but Jamestown is great if you want a bullet-hell shooter. Four player local co-op is very nice. WOW, how did I not come across this one? When I set up a 320x200 modeline in my xorg.conf file to use on my monitor's low-scan mode, I have to say that OpenTyrian was incredible! Running it with native scanlines honestly shows just how much Eclipse Software meant for that game to be something for the arcades. Hammerwatch is a pretty good gauntlet style game with 4p co-op & splitscreen keyboard/gamepad controls. We are enjoying it quite a bit at home atm. I'm looking forward to playing Devil's Dare on my new 4-player (linux-based) cab when it's finished. "Devil's Dare is a 2D zombie beat'em up, supporting up to 4 players to co-op and fight together locally. Being the spritual successor to Bitejacker, Devil's Dare carries the same theme of parodies, pitting classic game heroes against monsters straight out of 90s horror movies. " and many, many, many more !! Check out Jump 'n Bump from the LibreGames project. You won't regret it. Page created in 0.226 seconds with 51 queries.